​We provide WASUP ™ “wheelchair adapted standup paddle” boards to the percentage of our population who are challenged with standing and balancing. Our WASUP ™ board secures a wheelchair onto a paddle board and allows people with disabilities, balance challenged, and those needing assisance paddling, the opportunity to get out on the water and enjoy what was previously impossible; paddling a board from a wheelchair. Now known as WASUP™. 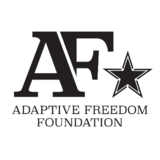 Adaptive Freedom Foundation is dedicated to offering open water experiences for people with disabilities and those that are excluded from participation. AFF will educate and promote adapting non-accessible activities. If we can float a wheelchair, on a paddle board, on the water, then our only limitation for including people with disabilities in participating in similar activities is our imagination. Because of donations and your support we are able to provide our services free of charge, through our 501(c)3, Adaptive Freedom Foundation.